In natural language processing (NLP), sentiment analysis is a form of assessing how people feel about such things as advertisement, a measure of perceptions of ideas or images they see, or even an analysis that uncovers how they react to events happening around them. The problem is, however, such analyses have rarely been used along with GIS or spatial analysis. This is now changing. One approach has been to use spatial data within social media data, such as in Twitter, and apply conventional sentiment analysis, which quantifies terms used that are negative or positive in feeling (i.e., usually adjectives in English) relative to nouns, such as actions or events happening around a person. Spatial regression and autocorrelation can be used to investigate relationships of how given places or spaces may affect mental health. This was the case in one study that investigated the relationship of space to mental health of Twitter users using an integrated spatial and sentiment analysis approach. The study found there were socio-economic factors that might lead to more depression among Twitter users. Spatial analysis and sentiment is potentially important for policy and gauging how people experience space. For instance, in a recent study on how parks affected sentiment of people, data from Twitter showed that people typically tweeted within 3-4 kilometers from a park’s center of activity and that parks largely created more positive feeling and attitudes. This suggested to the researchers that creating green spaces and parks near where people lived had a clear mental health benefit and overall positive perception about where people lived. Average distance from users’ “center of mass” (COM), the coordinate of the users’ main center of activity to the park, aggregated on park level based on the tweets posted from a given park. Map: Kovacs-Györi et al., 2018. 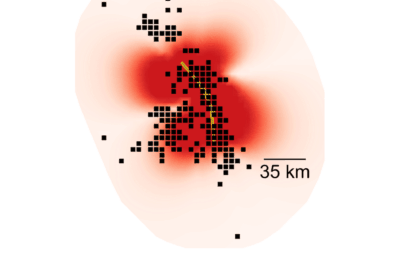 Analyses also apply temporal analysis to sentiment in a spatial environment. For instance, looking at the relationship between time, space, and sentiment in Massachusetts indicates that people tended to have more positive attitudes in public and commercial spaces at about midday or in the evening on the weekends. Social contact, leisure, and shopping appear to create the most positive sentiment for people, even when comparing urban and rural regions. Does Wealth Affect Sentiment in Neighborhoods? One might think that in neighborhoods, sentiment might be more positive in wealthier areas, as suggested by the earlier research discussed. While this is sometimes true, this was not always the case in another more recent study. In fact, where the researchers used more objective socio-economic data and compared it to sentiment people had about given neighborhoods in New York, there were differences found. While people often did view wealthier areas more positively, they were not always the most positive and less affluent areas that blended other benefits, including social experiences and activities, were also viewed positively. What these results show is that sentiment analysis is increasingly used with social media data where spatial data can be extracted. 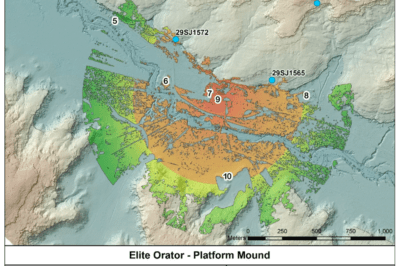 The research has shown it might not feasible yet to extend this type of research to other forms of spatial analysis, as spatial data are difficult to extract in more general text such as online newspapers or pdf articles. However, expanding and using other NLP approaches, such as analyses that determine location based on description, could potentially be one way in which other NLP methods could be integrated with GIS and spatial analysis to enable other forms of data to be better assessed for sentiment. 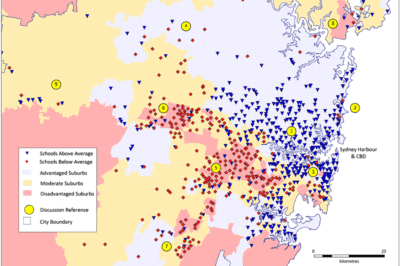 For more on using Twitter and spatial data within GIS and sentiment analysis approaches, see: Yang, W., & Mu, L. (2015). GIS analysis of depression among Twitter users. Applied Geography, 60, 217–223. https://doi.org/10.1016/j.apgeog.2014.10.016. For more on how parks affect mental perceptions of those experiencing them, see: Kovacs-Györi, A., Ristea, A., Kolcsar, R., Resch, B., Crivellari, A., & Blaschke, T. (2018). 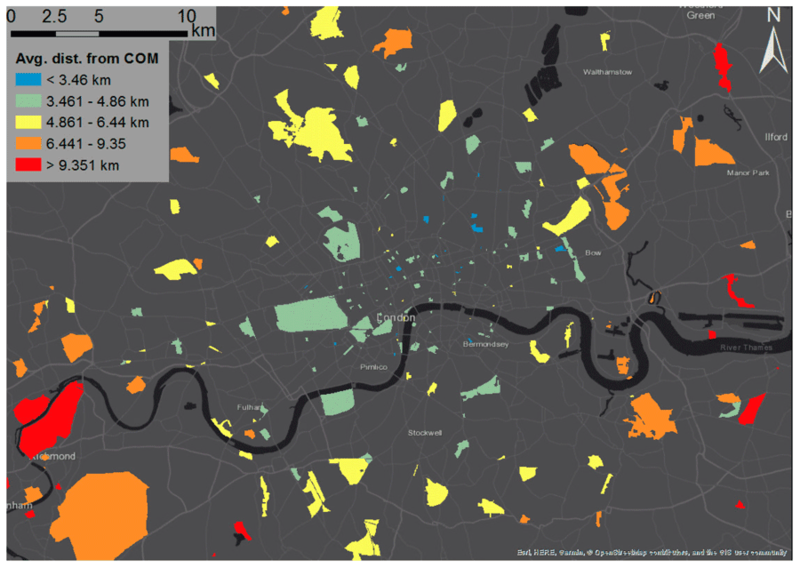 Beyond Spatial Proximity—Classifying Parks and Their Visitors in London Based on Spatiotemporal and Sentiment Analysis of Twitter Data. ISPRS International Journal of Geo-Information, 7(9), 378. https://doi.org/10.3390/ijgi7090378. For more on the study in Massachusetts on sentiment over time and space, see: Cao, X., MacNaughton, P., Deng, Z., Yin, J., Zhang, X., & Allen, J. (2018). Using Twitter to Better Understand the Spatiotemporal Patterns of Public Sentiment: A Case Study in Massachusetts, USA. International Journal of Environmental Research and Public Health, 15(2), 250. https://doi.org/10.3390/ijerph15020250. For more on sentiment and the relationship between objective data and subjective sentiment, see: Hu, Y., Deng, C., & Zhou, Z. (2019). A Semantic and Sentiment Analysis on Online Neighborhood Reviews for Understanding the Perceptions of People toward Their Living Environments. Annals of the American Association of Geographers, 1–21. https://doi.org/10.1080/24694452.2018.1535886. For more on service provision and sentiment from a case study in China, see: Su, L., Stepchenkova, S., & Kirilenko, A. P. (2019). Online public response to a service failure incident: Implications for crisis communications. Tourism Management, 73, 1–12. https://doi.org/10.1016/j.tourman.2019.01.011.